A no-fault breakup song set in a modern pop ballad style. Polish-born pop singer AGATA and I wrote this song back in 2002. It's a a "no fault" breakup song, where something in the relationship just changes, and the fire dies. This is a brand new recording, and an early single from my upcoming (Summer 2016) pop album, "In and Out of Love Again". 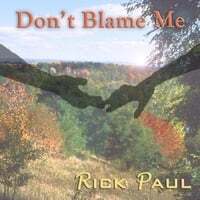 Performed, produced, mixed, and mastered by Rick Paul. Cover photograph and artwork by Rick Paul.